Sometimes it’s hard for the untrained eye to figure out what exactly is going on in a Picasso. Fortunately, the artist leaned toward informative, workmanlike titles. But after watching the above video by Evan Puschak, aka The Nerdwriter, I'm willing to concede that she’s standing on a jetty, a likely amalgamation of two of Picasso's lovers. His process for understanding a Picasso takes the gut response into account, but then fleshes things out with four additional steps. You can apply them to many other artists’ work too. It’s certainly helpful to know that the painting was made in 1939. 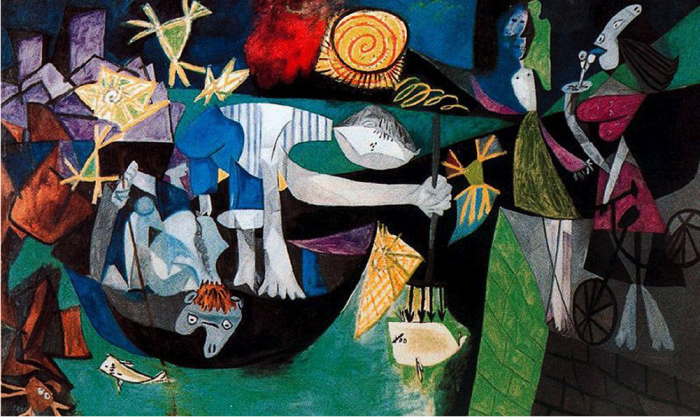 You probably don’t need the Internet to guess what world events were likely a source of preoccupation for the artist, whose “Guernica” was completed just two years earlier. All good art is trying to tell you something about your life. Your life… specifically. So understanding art is a process of understanding yourself, and vice versa. In both cases, you only learn by engaging. Watching isn’t enough, neither is reading or listening or thinking for that matter. From my perspective, engagement means writing. An idea that’s been snaking around in my videos for a long time is that we learn by saying, not thinking. You know something when you can articulate it, and for that you need words and sentences and paragraphs. So introspect, write down what your mind is doing. And when you watch a movie or look at a painting, write down how you feel about it. You’ll be amazed how one informs the other, and before long you’ll see some beautiful sparks. You can view the Nerdwriter’s other videos on his website or subscribe to his YouTube channel where a new video is published every Wednesday.